A pioneer in the handmade paper industry and the brainchild of Mahatma Gandhi, Handmade Paper Institute is India’s primal handmade paper factory based in Pune. The idea is to save the environment by making paper from waste material. Renamed to Papertells, this piece of stationery heaven was inaugurated by Jawaharlal Nehru on 1st August 1940. 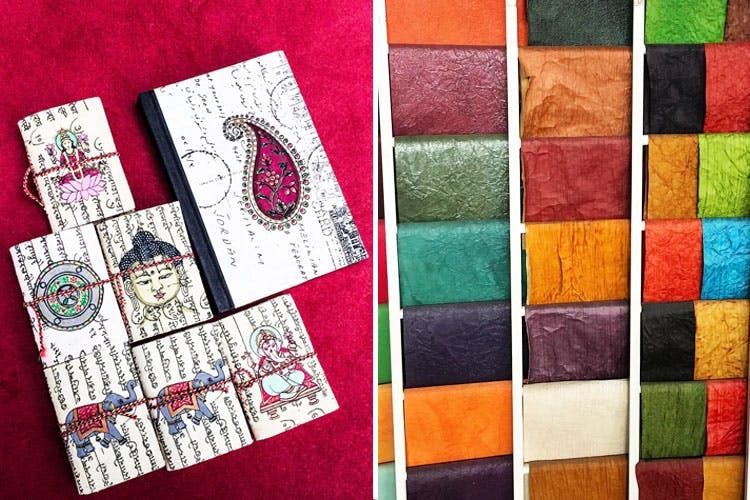 This one-of-a-kind handmade paper production center is also a showroom for art and retail paper. Go there to buy handmade chart paper, diaries, lamps, letterheads, envelopes, boxes, gift bags and so much more! The best part here is that you can pick them up at wholesale rates and save yourself a lot of money! With hand-made chart papers starting from INR 25 and notebooks priced as low as INR 110, this is your chance to make college projects and your work-desk super hipster! Here’s the best part- they also customise stationery as per your requirement! Apart from the price points, the variety of products available has us going back for more. There are times when we don’t even need anything but that temptation gets the better of us. We’re not complaining. Go grab the prettiest paper and stationery to please your heart! You can ask for the products to be customized as per your liking too! This is also a great place to pick up souvenirs from. These are priced between INR 10 to and INR 2,000 depending on the quality of paper used.